Jackson Tolaram Private Limited in 1970s' Bombay was typically cosmopolitan in character. The general manager Batliwala, a Parsee, the chief accountant Parekh, a Gujarati, the executive officer Nambiyar, a Maliyali, and chaprasi Dhonde, a Maharashtrian native form a miniature India in its busiest metropolitan city. Our hero Amol Palekar aka Arun Pradeep, the freshly appointed grade two supervisor of the company, has two names instead of a surname. It is also tiring to trace our heroine Vidya Sinha’s origin to any region or caste. Basu Chatterjee probably wanted to convey to his audience that Bombay paved the road for expertise not ancestry. If you want to gaze through 1970s' Bombay, Chhoti Si Baat is your entry ticket. The blooming of romance in BEST buses and on the streets of South Bombay, quaint cafes in Bandra, imaginary dates in bistros with Gateway of India in the background, Jehangir Art Gallery tours, Pamposh Restaurant luncheons, Almeida park courtship - all come in the same package. A still from Chhoti Si Baat where the lead characters meet at a bus stand. Arun and Prabha first meet at a bus stand where they queue up for bus number 86 at sharp five-past-nine. The bus is a slight detour from Arun’s office in the sense that it leads only to Prabha’s workplace. Arun follows his muse silently to her office everyday and reaches late to his office only to be summoned by his senior for explanation. In an exceptionally crafted screenplay for which Chatterjee also won that year’s Filmfare Award, there is some incredible dialogue writing. In the beginning of the film, the narrator explains to the audience that you can’t escape the queue system in Bombay unlike Delhi or Calcutta. That is a flawless representation of the unfaltering guideline regulating the city. There is also mention of how lonely men and women, who have nobody in the city, get married to each other and steady their existence in Bombay. Our common man Arun is a dreamer. Bombay makes that a little easy for you. In the city of Bollywood it probably takes less effort to imagine yourself as a heroic character who expresses all his unrequited desires and emotions. Even an occasional firing of the "relative" villain Nagesh is on the cards. Chhoti Si Baat mentions the famous metro and Eros theatre in “town” which is now a part of Mumbai’s heritage. The BR Chopra production has some smart in-film branding too. Zameer, another film by the same producer is our constant reference to the "filmy" identity of Bombay. In several scenes we can also see Parinay posters mounted on characteristic red buses buzzing around the city. Bombay is a tough city to survive. The common man’s one stop retreat in the 70s was Khandala. Arun reaches there with a long face, almost ready yet not ready to give up. Dadamoni aka Colonel Julius Nagendranath Wilfred Singh grooms our demoralised hero to fight the city’s pace since, like the crooked garage owner says, “Bambai me ullu bohot hain” (Bombay has a lot of fools). If you aren’t an opportunist, there is always a Nagesh (portrayed by Asrani) ready to fetch your crop. Maybe it is time to revisit 70s' Bombay and learn a thing or two from Col JNW Singh. The film opens at a small office in Vile Parle where Sodawala, Shastri, Bade Babu and Sudeep’s repartee continues with the neighbourhood mill’s siren wailing in the background. Bombay’s cosmopolitan persona is well captured in the diversity of characters in the film. The heroine, Zarina Wahab aka Chhaya, lives a clustered life with two brothers and a sister-in-law in a "chawl" on Arthur Road, Lower Parel. The space crisis is the most distinct feature of the financial capital where lakhs of people come everyday in search of work. Amol Palekar, as Sudeep, is a young 20-something man who is in love with Chhaya, also lives in a crevice of the city, sharing his "mess" with friends Abdul and Guha. One a struggling artist and another a struggling breadwinner, they depict the life of the 70s' common man grappling for acceptance and stability in Bombay. Bombay is the city of hyperbole where people dream big yet strive for a home, however unadorned. Sudeep describes his lodge as a palace with Babylonian gardens and Chinese wallpaper which has 170 rooms and 75 bathrooms for his brothers and himself. Bombay sets the tone of the film exploring the struggle of survival delicately. 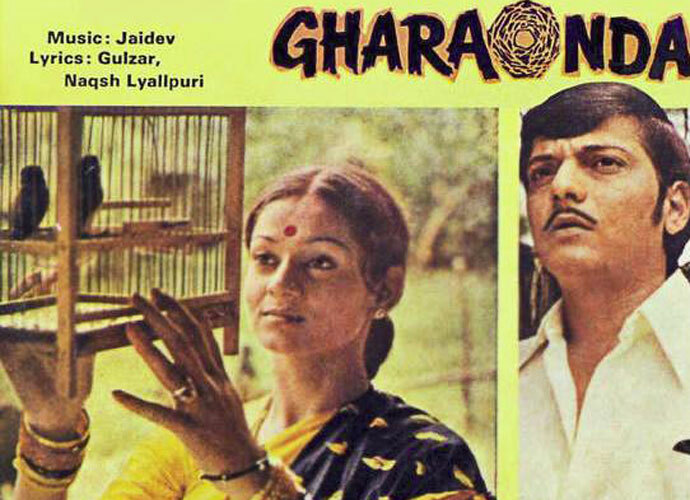 A still from Gharaonda which has the theme of space crunch in Bombay. Gharaonda’s audience visits popular dating spots of the city where couples who cannot afford restaurants and cafe’s regularly fulfil their romantic yearnings. Bombay probably was thoughtfully conceived with Worli sea face, Castella de Aguada or Bandra Fort, and other multiple rocky beaches as a consolation for such ill-starred couples who had nowhere else to go. The inexpensive and filling bhelpuri, another favoured fast-food available all over Bombay, is an attentive addition by Gulzar in the film’s screenplay. Amol Palekar in a bout of romance contains his desires saying, “chhota parivar sukhi parivar” (small family, happy family), taking us back to the cut-throat pace of Bombay where a small family is the only possible reality. The young couple face embezzlement at the very beginning when the big city broker sells them an under-construction apartment in Andheri East and thugs them without receipt. Guha loses his life as his mother Dina Pathak in a guest appearance breaks down saying, “Yeh mara sheher kha gaya use” (this dead city has eaten him up). Duped and stressed, our common man either runs away, commits suicide or collapses brick-by-brick just in the hope of a small abode in Bombay. Shreeram Lagoo, the mature lonely man, teaches Sudeep a lesson for the rest of Mumbaikars. Everyone lands here loaded with dreams and tends to take shortcuts to success, which is exactly where they go wrong. Gharaonda’s audience visits popular dating spots of the city. The striking contrast of Bombay and the countryside is elucidated in a conversation with Chhaya where they agree to the fleeting pace of Bombay. All characters in the film react situationally and are grey just like the city they live in. Gulzar’s “umr se lambi sadkein” (roads longer than life) is an absolute explanation of the loneliness experienced in the city. Director Bhimsen has added some key “Bambaiyya” elements to his feature. In a film about the middle class and aspirations, we have a quick sneak into modelling as a career option. However far away from the glam world, if you reside in Bombay you are closer to it than the others. The new entrant in the “mess” tells Abdul, “main idea bechta hai idea” (I sell ideas). There is no doubt that India was taught packaging and marketing by Bombay first. “Yeh Bambai hain, yahan, shamshaan ka raakh bhi bikta hain,” (This is Bombay, even ashes are sold here) he explains to his new roommates. Chatterjee’s Baaton Baaton Mein takes his audience to a Bombay within Bombay. The film opens in a railway station leading us to a Christian household. Pearl Padamsee and David Abraham are siblings living in the same building with their respective families. They are on the lookout for a groom for their beautiful Nancy who is recovering from a heart break. The director has us wandering through the streets of Bandra where our hero Tony, and Nancy his love interest, live. The Christian community in Bandra back in the 70s was as flourishing as today. The rain-washed architecture back in the day swamped with greenery around and a sea close by made the setting for an engaging, organic romance between Amol Palekar and Tina Munim. They take the ten-past-nine local to town and their friendship blooms with Tom Uncle’s constant watering. Bombay became the setting for an engaging, organic romance between Amol Palekar and Tina Munim in Baaton Baaton Mein. The local train looks much like today’s with its rush, yet what adds acute nostalgic value is the passengers. Retro costumes with breezy pastel shades worn by junior artists take us 30 years back in an instant. What trumps over everything else are daily passengers reading newspapers, magazines and books replaced today by mobile phones. It wouldn’t be wrong to say that people read more, interacted more and stayed more in the moment not distracted by virtual reality. Bombay’s gift to lovers is the sea that outlines it. Tony and Nancy go to the beach often and savour their time alone. Their break-up also converts into a happy ending at the shore where Tony finally decides to marry Nancy, comforted by the calm and quiet of the sea. The dialogues have mentions of Pali Hill, Marine Lines, Church Gate, Versova - making the film more and more relatable for anyone who has lived in or visited Mumbai. Aunty Philomina suggests Nancy marry a well settled boy with a house in Goa and a salary of Rs 1,200 instead of other philandering Bombay rouges. We suddenly start noticing Bombay with more fondness. The city, which is known for its pace and individual approach towards life, houses merry Christian families actively participating in the future of their sons and daughters. For most inhabitants of Bombay, especially those living in Bandra, it is commonplace to know a person or two from the Hindi film industry. Amit Khanna’s “yeh lag raha hain saari uljhanein sulajh gayi, yeh dhadkano ki baat dhadkane samajh gayi. Na boliye ke bolne ko kuch nahi raha” quite beautifully explains romance in its elementary form in 1978. Amol Palekar till date represents our common man like none other. In Chhoti Si Baat, Gharaonda and Baaton Baaton Mein, our "common man" as Arun, Sudeep and Tony delight us, offends us and warms us up to the Bombay of his era.